Both of my children used Wordsmith to some degree at some point over the years. Looking back at my records, I see that Holly used it along with Easy Grammar and John used it along with his grammar & writing curriculum—a curriculum in which I elected to have him skip most of the writing parts to make more time for Wordsmith. Wordsmith is a creative writing program that is written by Janie Cheaney. In the beginning of the teacher's guide, Mrs. Cheaney writes what Wordsmith will do and what it will not do. I will summarize her words in two sentences. 1. Although the student will learn a little grammar, this course does not teach comprehensive grammar. 2. Although the 1principles of writing, which are taught in this book, will help with any type of writing, this book does not teach expository writing. The content of the student's book is divided into 3 parts. The first part, Word Games, is designed to help the student appreciate the richness of words, of vocabulary, but not necessarily in the realm of definition, but in using specific words. The second part, Building Stronger Sentences, teaches the student to skillfully build sentences while being mindfully aware of proper syntax. Part three, Now We're Writing, is a series of writing assignments that puts to use the skills learned in parts one and two. Part three is just as guided as parts one and two. The student will write poetry, paragraphs, dialog, and a story. The student's book can be used like a workbook [consumable] because it has lines for some of the exercises. However, if you plan to use Wordsmith with your other children, then instead of writing directly in Wordsmith, your children can use a notebook or composition book for all of the assignments and exercises. Either way, the student will need paper, a notebook, or a composition book for the longer assignments that are not meant to be written in the student's book. 1. A Course Overview. Course overviews are always helpful. Not only can you use a course overview to write a course description, you will learn the basic goals of the program. 2. Revision from a teacher's point of view. 3. A detailed 36-week schedule. Detailed as in, on each day, the "teacher's information" is noted along with example answers as needed. 4. Additional writing assignments follow the 36-week schedule. 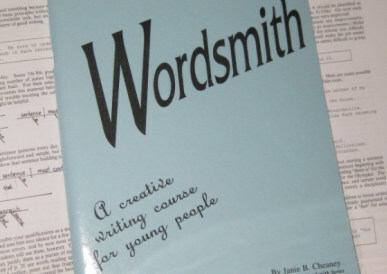 I found Wordsmith, A Creative Course for Young People agreeable to our method of writing instruction. The method of refining word choice, building up sentences with careful consideration to syntax, and then applying those two skills to writing is, in my opinion, "perfect." I imagine that many writing books use that logical sequence of writing instruction. In Wordsmith, the sequence is clearly laid out in a user friendly format. If you decide to use it, I recommend using it along with a grammar instruction program that contains very little or no writing assignments, such as Easy Grammar.